Years ago a friend of mine in Santa Barbara was attending a conference where one of the speakers was Robert Muller, Assistant-Secretary General of the UN. Barbara Gaughen is one of the most dynamic, positive people I know and she has the perfect profession for her out-going, we-can-do-anything personality: she's a public relations specialist for authors. At the conference, Barbara and Robert talked a lot and at some point, Robert said, "I love you, Barbara." For Barbara, the moment is like a video snippet on YouTube, she can play it over and over as if she were in that moment. "I knew that it was more than conference chatter," she states. "And, I knew I had 30 seconds to make a decision that would impact the rest of my life." She wound up replying, "I love you, too, Robert." That was the beginning of a life adventure that took Barbara all around the world and introduced her to people like Ted Turner, Deepak Chopra, and Mikhail Gorbachev. She and Robert spent half their time in Costa Rica working for the development of the United Nations University for Peace. In September, 2010, Robert died and Barbara was asked once again to reinvent her life. She is back in Santa Barbara and has turned her energies to helping authors bring their messages into the world, specifically through the Global eBook Awards program. But, she is also, finally, settling down to tell her story. Her working title is "The 30 Second Window ... when the tiniest decision can transform your life." I have long been fascinated by those tiny decision windows that change everything. The one that comes to my mind happened one night shortly after my husband died. I was sitting at the computer, distracting myself on google, when I found an art workshop in a tiny fishing village just south of Puerto Vallarta. Richard and I had vacationed in PV and it was one of our favorite places. But, it was too soon to be rushing off to a "vacation." There were many reasons not to go and only one reason to go ... it called to me. The decision was made in 30 seconds and within a week I was in a different time and place, on my way to a different life. I was delighted when Barbara asked me to help her with her book and we would love to hear about your "30 second story" that transformed your life. Drop a note in the comment section below ... or email me at jwycoff at me.com. 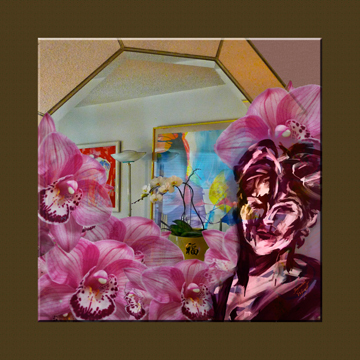 This is an Intuitive Lifescape from Barbara's house which is a lush oasis of orchids, art and beauty.